Featured in The New York Times, TIME, Forbes Life, MountainLiving, Sunset, Outside Magazine (Editor’s Choice Awardsof Perfect Things), and on HGTV, Jamie Mackay’s Wheelhaus cabins require minimal maintenance and are well-built with great design. 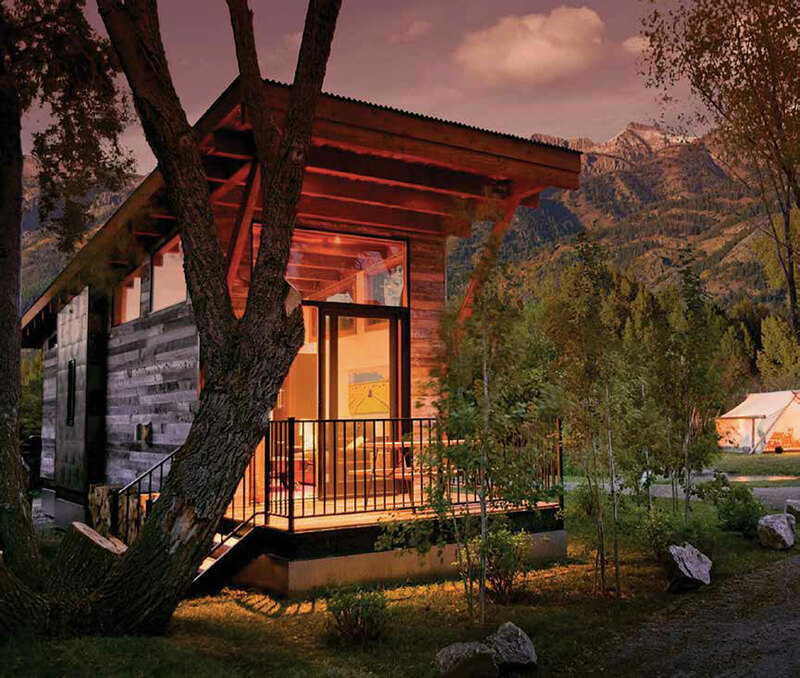 And now these cabins are available on land near the big fun in Jackson Hole at Fireside Resorts. With every detail tailored to optimize the use of the 400-square-foot space, Mackay built his ‘luxury modular dwellings’ with a mountain design aesthetic, and his guests quickly fell in love with the quality, comfort, design, and efficiency, so much so that they purchased them in quantity for other vacation areas. Now you can complement your outdoor lifestyle by channeling your inner “let’s do this!” and become an owner of a fully-furnished retreat with sleeping for four just minutes from Jackson Hole Mountain Resort and Grand Teton National Park. Instant gratification? Yes. Investment opportunity? Yes. Future pad for every season, any reason? Perfect. Because Mackay took time to fine-tune the experience of living in a purposeful way, his innovative approach to space management is clear and effective. “The Wedge” design has an angled roof that reaches 17’ in the living room, accentuating the generous main space and the natural light from its large sliding glass door and trapezoidal windows that offer a view of the deck and surrounding aspen trees. Ranchwood siding covers the exterior, while the interior boasts an atmosphere of trend-setting cozy calm. Curated with hardwood floors, a leather sofa, two cowhide ottomans, barn wood side tables, custom wrought-iron lamps, and a railroad cart coffee table, the space is open, friendly, and ready for an intimate dinner for two, or with the covered front porch, a couples’ cocktail party or family BBQ. The space seamlessly integrates the natural surroundings with its ease of use and is beautifully lit by low-profile track lighting. There’s a gas-burning fireplace to take the chill off an evening of summer stargazing and a 42” HD flat-screen television for movie nights after a long day on the slopes. The living room area includes the kitchen where functionality is reflected in the well-considered design. Featuring refined concrete countertops that highlight the modern rustic cabinetry, a two-burner cook top, full-size refrigerator/freezer, microwave, sink, and dishwasher, the essentials are pleasingly sophisticated. In the cabin’s one bedroom is a sumptuous king-size bed, fluffed out with duvets and down pillows. A pair of side tables accompanied by attractive linen lamp-style scones complement a butcher-block countertop that pulls double duty as a desk and alternatively as support for an under-counter hanging closet with a set of four drawers. Another 42” HD flat-screen television is thoughtfully placed, and local artwork and timber ceilings add to the ambiance. Sunshine or snowflakes, it is inviting and comfy. THE ULTIMATE TINY HOME STATEMENT. A stacking washer and dryer complete the room with shelving for towels and home accessories. When you’re busy with the outdoors, daily housekeeping is available, along with an on-site concierge who knows the area like the back of her hand. And, if you’re thinking you’d be up for sharing, there’s the added bonus of an established rental program. Christian Cisco, Associate Broker at Sotheby’s International Realty representing the property, says, “It’s tenancy-in-common (a transferrable ownership interest in an undivided real estate parcel), which makes it an incredible opportunity and a progressive and modern form of ownership. 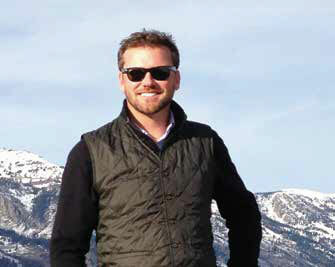 There is no other tenancy-in common in Teton County, so it’s very unique.” And a great opportunity. “The Wedge” has a bigger sibling, affectionately named “The Caboose.” Take a “Wedge” and add a five-foot tall loft that accommodates either two twin beds or a king, surround it with multiple windows, and your party just got livelier. There’s more to discover when you gaze out at visiting moose and remember you’re in your modern-day playground with an adventure just waiting to be had. AT THE TIME OF PRINTING, 6 OF THE 23 CABINS WERE UNDER CONTRACT, AND WITH A COMPARABLE PRICE (READ: GO NOW, THIS IS A STEAL) FOR THE AREA, YOU’LL WANT TO EXTEND A SUMMER INVITATION TO YOUR TRIBE SOONER RATHER THAN LATER. 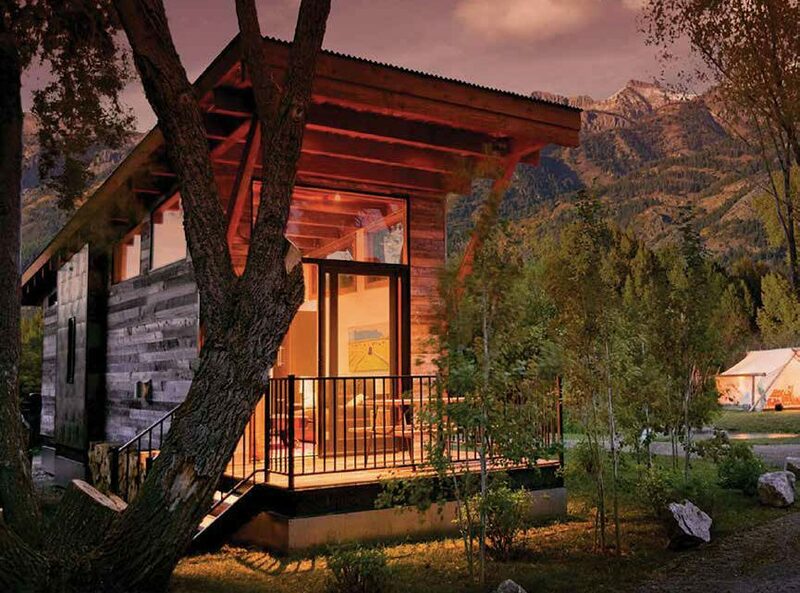 WANT YOUR OWN CHIC MOUNTAIN CABIN IN JACKSON HOLE?